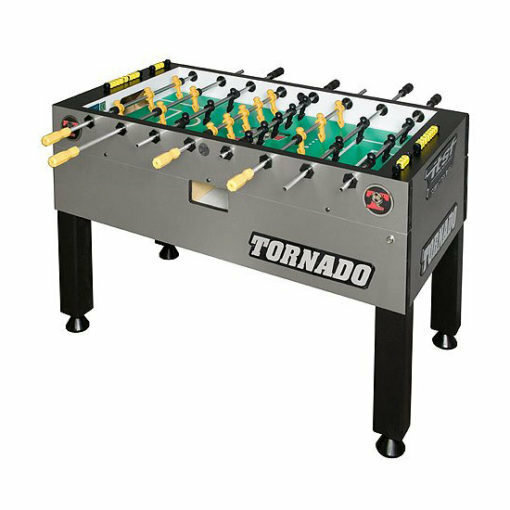 The Tornado T-3000 Tournament Foosball Table is Tornado’s finest quality commercial grade table. The best table in the world is now loaded with new enhancements that keep it at the forefront of the entertainment industry. The T3000 sets the industry standard for smooth play and reliability. New designed scorekeeper has higher scoring capabilities. Redesigned player “foot” allows more precise ball control with higher cross hatching and square sides. New end protectors help to preserve the laminate edges. New, thinner inner bearing design does not allow the ball to be passed between the man and wall. Patented rubber bumper, player, and rod guarantee super-fast, durable play. *International Table Soccer Foundation (ITSF) certified for training and tournament play on 1-man goalie table only. Cabinet design allows table to be shipped partially assembled, allowing for quick and easy set-up on location. Approximately 30 minutes from box to first game!